The Longest Day - my first infusion! How wonderful it was to realize that the first day of my clinical trial was also The Longest Day! We celebrate the summer solstice as teams around the world honor the strength passion and endurance of those facing Alzheimer's. I originally was sad I couldn't join a team and go for a walk, go bowling, wine tasting, etc. I soon realized that I could create my own team and raise money during my day at UCSF receiving my first infusion! My husband and I chronicled the entire day starting with our fist stop at 7am for coffee at Starbucks. I created an event on Facebook and continued to share the experience and my day. We video taped them giving me the infusion and I had an opportunity to thank everyone for their support over the last year. It really did feel like 'the Longest Day' to me...hours of cognitive testing followed by the infusion and then a long drive home. It was fun though and now we have something to look back on as the trial progresses. We also raised over $600 and I'm very happy about that! Yesterday (the day after my infusion) I had one of the best days I've had all year! I woke up very happy and full of energy. I slept well the night before and was thrilled to be so alert and present. I don't know if the infusion had anything to do with it, but maybe whatever they gave me helped! It's a double blind trial so no one knows if I'm getting the crenezumab or a placebo. I'm just extremely happy that I'm feeling good and have more energy. It's a two year trial and I'm looking forward to what's next! I'm also almost done with another scarf! I've been knitting most days and look forward to taking it with me on our trip to Chicago for the National Early Stage Advisory group meeting😀 The blessings bestowed on me each day continue. I'm very excited to see what my role will look like and where I can serve others and help the most. It's hot -- really hot today. Over 100 degrees and my energy level is low. We did go to church and I made my amazing husband a nice breakfast. We had lunch with my girls and our grandsons and Bob's youngest son Jonny. It was great, but the restaurant was loud and crowded and I was feeling overwhelmed. Afterwards Ryan and Michael and Lisa went to a movie suitable for kids and we went to a silly movie that was very inappropriate and a little stupid, but it was nice to be in a cool place. I've been resting since we got home and have a headache. I've been having headaches almost every day and I'm not sure what's going on. I've been taking more naps these days, but feeling happy and continue to exercise, journal and started back on my Spanish again too. I've been knitting and finished another scarf, I'm social and have lunch dates with my friends. But I can't help but feel things are changing and that my weariness is part of the progressive nature of Alzheimer's. I guess time will tell. I truly take one day at a time and I thank God for every day, and do my best to bless all those around me. It lifts me up to give back and I know that is my purpose. Next week is my first infusion -- it's on July 21st -- The Longest Day! I'm pretty excited about that. I plan on posting pictures and sharing my experience on Facebook and social media. Knowledge is power! Helping others to understand what I'm going through will hopefully help them with their issues and challenges. The highlight of the week was having Ryan & Michael stay at our house. I love waking up with them and spending time alone with them. Just Buni and her babies 💕I also got to watch them play tennis and am just amazed how two little boys can hit the tennis ball so hard and with such power! Very impressive and excited to see how they do in their next tournament. Tomorrow Bob's son Phil and wife Elizabeth come to stay for a few days with their darling baby. I'm so excited to have them in town and will take things slow so that I can enjoy every moment. I'm posting the 'PBS Brief But Spectacular' clip that Chris and I did so I can share it easily, and have it for reference. It will be interesting to see how things change for me in the next few years. Having a video will help me see that versus trying to remember. I hope you enjoy it. Many of you might have seen it already on Facebook. Change is not good for me. Stress is not good for me. I get nervous and scared and today I broke down and cried. I mean really cried outloud with big tears. It took one day to do each bedroom. Yesterday wasn't too bad when they worked on Ryan & Michael's room (aka guest bedroom). But this morning at 8am they arrived and had to move all the furniture out of our master bedroom so they could remove the carpet. It was early and I was in my workout clothes and happy to help with the little things. Things got really ugly and stressful when I realized that my cat Rusty had to be locked in the garage all day, and that my crazy Siamese cat Monty was hiding. The front door was open for the workers so I was in a panic. Rusty was crying and that didn't make things any easier. I finally calmed down and needed to rush to get ready for my Alzheimer's support group. But I couldn't get ready!! All my clothes and shoes were blocked by the bedroom set that we moved to the bathroom. For a normal person that wouldn't have been a big deal and you would have found a solution, but I was in a panic! We easily rectified this by moving everything out of the bathroom so I could get my clothes out of the closet and I took a shower in our guest bathroom since Rusty was in our Master bath. Whew .... ok I survived but was stressed out. I soon realized that I wasn't really ok. I hate change, chaos and cats meowing. At my Alzheimer's support group when it was my turn to talk I couldn't stop crying. I'm still crying about it as I type this. I love my cats and I was so scared something was going to happen to them. I was in panic mode all day. It was painful for me to leave knowing that Rusty was trapped in the garage and Monty was hiding. I also think I was crying because change and disruption to my normal schedule stresses me out, and that is a very vivid reminder that I'm not the same person I was two years ago. I'm better now.....but the house is still a mess and the bedroom gets painted tomorrow. I still can't find Monty but I'm pretty sure he didn't escape. He's too much of a scared cat. Rusty is ignoring me but happy to be in the living room looking at the birds outside. The other amazing news I received is that I have been selected to serve on the 2017 Alzheimer's Association National Early Stage Advisory Group! This is something I applied for last year when I first got my diagnosis. It's a one year term and I am so excited to take my advocacy to a new level. 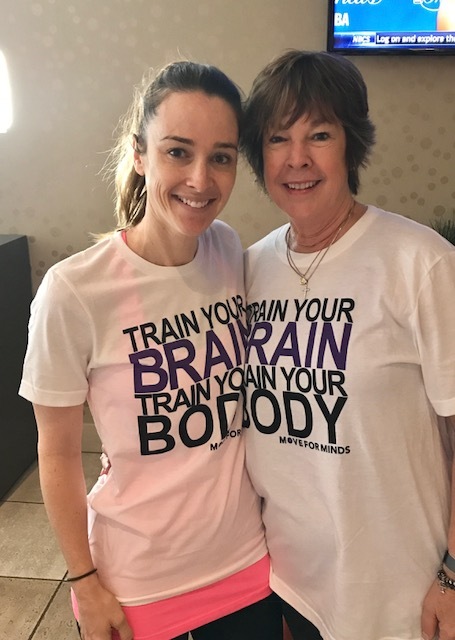 To speak and share my story at potential events around the world and help shape additional services that the Alzheimer's Association might offer to those with early stage Alzheimer's. Our first meeting is later this month. Our amazing week ended with a fantastic event at the Equinox Sports Club in San Francisco where the Women's Alzheimer's Movement (founded by Maria Shriver) hosted a multi city mind healthy workout, followed by amazing snacks and a panel of experts who spoke on healthy eating, elder care issues and the science of Alzheimer's. The work out was intense but enjoyable and we ended with a wonderful meditation and cool down. My youngest daughter was there as well as a few friends which made it even more special. The panel was moderated by NBC Anchor, Jessica Aguirre and she did a fabulous job! My key take away was to make sure you eat 'Alzheimer's healthy'. Which means you are eating to eliminate inflammation! We can do that by eating mostly plants that are rich in color, including mint and spices. The doctor also mentioned that our portion sizes for protein should be very small, not take up the entire plate our food is on. That was a good reminder -- and she stressed organic, grass fed meats, minimal sugar and no processed foods. It was another amazing week for me and my family. I have decided to appoint Bob as my official press agent and social media executive! I think that sounds like a fun job. He certainly has many more connections than I do and can help spread the word and help to find a cure and he is more than happy to do so.